At a Customer Acceptance Readiness Review at North American, NASA formally accepted spacecraft 002. The vehicle was then demated and shipped to White Sands. "Apollo Monthly Progress Report," SID 62-300-42, p. 1.
a seismic experiment. MSC informed Newell on November 2 that negotiations were being initiated. Letter, Newell, NASA, to Director, MSC, "Selection of Scientific Investigations for Early Apollo Lunar Landing Missions," October 1, 1965; letter, Director, MSC, to Newell, NASA Headquarters, November 2, 1965. MSC informed Grumman that the Center had awarded a contract to AC Electronics for the development of an optical tracking system for the LEM (as a possible alternative to the rendezvous radar). Until MSC reached a final decision on which mode to use, Grumman should continue building the LEM to accept either of these navigational devices. Flight Crew Operations Directorate requested the decision be deferred pending evaluation of an operational paper. Letter, R. Wayne Young, MSC, to GAEC, Attn: R. S. Mullaney, "Contract NAS 9-1100, Item 3; Selection of Rendezvous Radar or Optical Tracker for LEM Navigation Requirement," October 1, 1965; memorandum, Donald K. Slayton, MSC, to Manager, ASPO, "LEM Optical Tracker," October 1, 1965. Memorandum, Robert C. Duncan, MSC, to Distr., "Apollo primary guidance system star tracker and horizon photometer," October 1, 1965. Memorandum, James H. O'Kane, MSC, to Chief, Crew Systems Division, "Report of trip for USGS Apollo support in Arizona," November 1, 1965. MSC ordered Grumman to halt work on both linear-shaped charges and gas-driven guillotines as a method for severing the LEM's interstage umbilical. Instead, the contractor should use two mild-detonation guillotines or one dual-blade device. Letter, James L. Neal, MSC, to GAEC, Attn: John C. Snedeker, "Contract NAS 9-1100, Contract Change Authorization No. 142, Mild Detonating Fuse Driven Guillotine," October 4, 1965. As a result of a design meeting on September 2, MSC ordered North American to make a number of detailed hardware changes in the CM uprighting system for Block I spacecraft. TWX, C. L. Taylor, MSC, to NAA, Space and Information Systems Division, Attn: J. C. Cozad, subject: "Flotation Uprighting System Meeting Conducted at NAA September 2, 1965," October 5, 1965. Letter, Shea to Phillips, "Apollo In-Flight Experiments, Flight AS-204," October 5, 1965. MSC requested that Grumman study the feasibility of a "fire-till- touchdown" landing procedure for the LEM. Grumman was to investigate especially performance factors surrounding crushing of the descent engine skirt, or possibly jettisoning the skirt, and was to recommend hardware modifications required for this landing mode. TWX, R. Wayne Young, MSC, to GAEC, Attn: R. S. Mullaney, October 6, 1965. "ASPO Weekly Management Report, August 12-19, 1965"; MSC, "Minutes of Senior Staff Meeting, October 1, 1965," p. 1; MSC, "ASPO Weekly Management Report, October 7-14, 1965"; memorandum, Joseph N. Kotanchik, MSC, to Chief, Guidance and Control Division, "Protective coating to prevent beryllium corrosion inside the Apollo Command Module," November 4, 1965. The Instrumentation and Electronic Systems Division (IESD) proposed that the LEM's inflight VHF antenna might be used as a link to astronauts on the surface of the moon as well. (LEM communications had to provide VHF contact with the crew outside the spacecraft at ranges up to three nautical miles. The VHF antenna, however, had been designed only for the flight portions of the mission, and to meet this communications requirement another antenna was being added to the LEM at a cost of between 1.36 and 2.26 kg [3 and 5 lbs].) IESD offered to study the coverage and range of the inflight antenna while on the lunar surface, and suggested that the three-mile range requirement might be relaxed. The additional VHF antenna might thereby be obviated. Also, IESD attended a preliminary design review at Autonetics on the signal conditioning equipment (SCE) for the Block II CSM. IESD concurred in several modifications to the Block I design (adding a redundant power supply; hermetic sealing of equipment; and repackaging to fit the equipment bay in Block II CMs). These changes reduced the SCE's weight from 22 to 19 kg (47.5 to 41 lbs) and, because of more efficient power supply, lowered its power consumption from 65 to 35 watts. North American was studying ways of perhaps lightening the SCE even further. "ASPO Weekly Management Report, October 7-14, 1965." Crew Systems Division (CSD) established vibration limits for the crew of the LEM. This action followed the final LEM vibration test with human subjects at Wright-Patterson AFB and a review of the test program by CSD and Grumman engineers. Also, in what CSD described as "the start of a long range program for familiarizing Apollo suit technicians with field and launch operations," the Division reported that it had sent an Apollo suit technician to Cape Kennedy to take part in the forthcoming Gemini VI mission. A drop in the boilerplate 6A series, using flight-qualifiable earth landing system (ELS) components, failed because the braking parachute (not a part of the ELS) did not adequately stabilize the vehicle. MSC invited North American and Northrop-Ventura to Houston to explain the failure and to recommend corrective measures. Because of the less-than-perfect firing of its retrorockets, Luna VII , another Russian moon probe, was destroyed on impact. The craft, launched four days earlier, was thus the third failure, Western observers believed, in Russia's attempt to soft-land a spacecraft on the moon. Space Business Daily , October 11, 1965, pp. 190, 194; Astronautics and Aeronautics, 1965 , pp. 460, 463, 464-465, 467. A test model of the Lunar Landing Research Vehicle, designed to simulate lunar landings, was flown by former NASA X-15 pilot Joseph Walker to an altitude of 91 m (300 ft). Built by Bell Aerosystems Company under contract to NASA, the research craft had a jet engine that supported five-sixths of its weight. The pilot manipulated solid-fuel lift rockets that supported the remaining one-sixth, and the craft's attitude was controlled with jets of hydrogen peroxide. Astronautics and Aeronautics, 1965 , p. 465. Memorandum, Joseph N. Kotanchik, MSC, to Manager, ASPO, "Launch configuration of SC 009," October 19, 1965; MSC, "ASPO Weekly Management Report, October 21-28, 1965." To ensure compatibility with the spacecraft, MSC specified weight and storage details for the extravehicular visors. The devices, two of which would be carried on each mission and transferred from the CM to the LEM, would afford impact, thermal, and ultraviolet protection for the crew during operations in space or on the lunar surface. Letter, R. Wayne Young, MSC, to GAEC, Attn: R. S. Mullaney, "Contract NAS 9-1100, EMU EV Visor Assembly," October 12, 1965. NASA was negotiating with General Electric Company to provide 56-watt isotopic power generators for the Apollo Lunar Surface Experiment Packages. The Atomic Energy Commission would manage detailed design and development of the unit based on MSC studies of prototypes. Astronautics and Aeronautics, 1965 , p. 476. Memorandum, Maynard, MSC, to Manager, ASPO, "Post-landing flotation requirements," October 15, 1965. NASA announced that it had selected Lockheed Electronics Company of Houston, Texas, to provide broad data-handling support at MSC. Negotiations on the contract (valued at more than $3 million) began shortly thereafter. MSC News Release 65-93, "NASA to Negotiate with Lockheed Electronics Go. for Computer Programming Support," October 15, 1965; letter, George E, Mueller, NASA, to Robert R. Gilruth, MSC, October 29, 1965. MSC ordered Grumman to discontinue use of zinc and cadmium on all production LEMs. This action followed performance studies by the Reliability and Quality Assurance Division that showed a deleterious effect of space environments upon these metals. Letter, R. Wayne Young, MSC, to GAEC, Attn: R. S. Mullaney, "Contract NAS 9-1100, The use of Cadmium or Zinc Plate in the Apollo Spacecraft," October 18, 1965. To solve the problem of controlling bacteria in the LEM's waste management system (WMS), Crew Systems Division (CSD) recommended some type of passive control rather than periodically adding a germicide to the system. CSD described two such passive techniques, both of which relied on chemicals upstream from the WMS (i.e., in the urine collection device in the space suit). MSC began studying the feasibility of this approach, and ordered Grumman also to evaluate passive control in the contractor's own investigation of the bacteriological problem. Letter, R. Wayne Young, MSC, to GAEC, Attn: R. S. Mullaney, "Contract NAS 9-1100, Bacteriological Control for LEM Waste Management Subsystem," October 18, 1965, with enclosure. A meeting was held at Flight Research Center to discuss several items relating to the Lunar Landing Research Vehicle (LLRV) and Lunar Landing Training Vehicle (LLTV). Attending were Dean Grimm, Robert Hutchins, Warren North, and Joseph Algranti of MSC; Robert Brown, John Ryken, and Ron Decrevel of Bell Aerosystems Company; and Gene Matranga, Wayne Ottinger, and Arlene Johnson of Flight Research Center. The discussions centered around MSC's needs for two LLRVs and two LLTVs and the critical nature of the proposed schedules; alternatives of assembling a second LLRV ; clarifying the elements of the work statement; and preliminary talks about writing specifications for the LLTV. From a schedule standpoint, it was decided that both LLRVs would be delivered to MSC on September 1, 1966. MSC planned to check out and fly the second LLRV (which needed additional systems checkout) with their crew and pilot on a noninterference basis with LLRV No. 1, the primary training vehicle. NASA Internal Memorandum for those concerned, Gene J. Matranga, LLRV Project Manager, "Meetings held during the week of October 17 relating to the LLRV," October 26, 1965. The MSC Mission Constraints Control Panel (MCCP) held its initial meeting. The panel's function was to resolve all conflicts between launch vehicle, spacecraft, and operational constraints. Also, once the preliminary reference trajectory was issued, the MCCP must approve all constraint changes. These would then be included in the mission requirements. Memorandum, Robert V. Battey, MSC, to Distr., "Minutes of 1st Mission Constraints Control Panel Meeting," October 26, 1965, with enclosure. To save weight, Crew Systems Division was studying the feasibility of using three one-man liferafts and a composite set of survival gear in Block I CMs. Apollo spacecraft 009, first of the type that would carry three astronauts to the moon and back, was accepted by NASA during informal ceremonies at North American. Spacecraft 009 included a CM, SM, launch escape system, and adapter. Astronautics and Aeronautics, 1965 , p. 485. To support studies on equipment stowage, North American agreed to maintain mockups of the crew compartments in the two blocks of CMs. The contractor's effort would be geared for the first manned flight for each series of vehicles (spacecraft 012 and 101). "ASPO Weekly Management Report, October 21-28, 1965." TWX, Phillips, NASA, to Kurt Debus, KSC, Robert Gilruth, MSC, and Wernher von Braun, MSFC, subject: "Saturn IB Launch Schedules," October 21, 1965. MSC News Release 65-96, October 21, 1965. To enable MSC's Mission Control Center (MCC) to handle Apollo flights, MSC announced that NASA's contract with IBM for computer systems would be extended. For an additional $80 million, IBM would convert the MCC to newer equipment and would use more advanced support techniques. The contract would contain provisions for conversion to an incentive fee type. MSC News Release 65-97, October 21, 1965. NASA announced that it had selected 10 areas on the moon as subjects for Lunar Orbiter's cameras during 1966. These areas encompassed most major types of lunar terrain. Most were suitable - and potential - landing sites for Surveyor and Apollo spacecraft. NASA News Release 65-335, "NASA Selects 10 Potential Photo Areas for Lunar Orbiter," October 22, 1965. 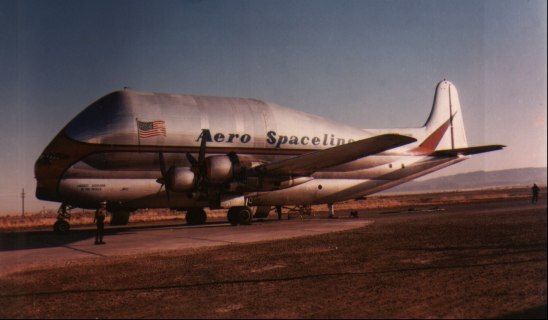 The Pregnant Guppy aircraft, which was used extensively by NASA to transport spacecraft during all phases of the Apollo program. Letter, Edmund F. O'Connor, MSFC, to MSC, Attn: Joseph F. Shea, "Pregnant Guppy emergency engine change, October 23-26, 1965," November 18, 1965. MSC authorized North American to modify the Block II CSM design to provide for installation of a luminous beacon compatible with the LEM tracking system. The CSM beacon could replace the rendezvous radar and transponder. Letter, J. B. Alldredge, MSC, to NAA, Space and Information Systems Division, "Contract Change Authorization No. 455," October 26, 1965; memo, Owen E. Maynard, MSC, to Project Officer, CSM, "Deletion of automatic actuation capability of VHF recovery beacon (Block II)," October 8, 1965. At a meeting with Grumman, MSC agreed with the contractor's basic design of the LEM's descent-stage base heatshield and its installation and access. MSC asked Grumman to demonstrate accessibility, installation, and removal of the heatshield on the M-4 mockup. Letter, R. Wayne Young, MSC, to GAEC, Attn: R. S. Mullaney, "Contract NAS 9-1100, Implementation of Action Items," November 3, 1965, with enclosure, "Abstract of LEM Base Heat Shield Review," undated. Owen E. Maynard, Systems Engineering Division chief, advised his branch managers of the U.S. Public Health Service's (PHS) growing concern that Apollo spacecraft and crews might bring organisms back from the moon. (See September 27.) PHS feared that such organisms would be "capable of multiplying in the earth environment and [that] precautionary measures must be undertaken to prevent global exposure." Therefore, Maynard told his group, PHS believed that the CM, its environment, and its crew must not be allowed to contact the earth's environment. Maynard further advised that efforts were already underway to define the design of an isolation facility, and isolation facilities for the recovery ships were being contemplated. Memorandum, Maynard, MSC, to PHS Branches, "Earth contamination from lunar surface organisms," October 29, 1965. Seven flights were made with the Lunar Landing Research Vehicle at Flight Research Center during October. The first three were in support of X-15 conference activities, and the last four were for attitude control research. Five of the landings were made in the lunar simulation mode. Letter, Office of Director, Flight Research Center, to NASA Headquarters, "Lunar Landing Research Vehicle progress report No. 28 for the period ending October 31, 1965," sgd. Paul F. Bikle, November 2, 1965.